One of the rarest forms of Techno-Wizardry are techno-wizard cybernetics and bionics. There is only a small number of techno-wizards on Rifts Earth that know how to make these magical cybernetics and bionics. Techno-Wizard Bionics have many advantages over normal bionics and cybernetics but are far more expensive and are very rare. Because of this, only the wealthiest can afford techno-wizard cybernetics and about ten normal cyborgs can be converted for the cost of one techno-wizard cyborg. Because of this, few armies will actually build a large number of techno-wizard cyborgs. The individual cybernetics are popular with adventures who do not want the loss a normal bionic limb causes and do not want the reduced physical abilities on a bio-system. They restrict the magical and psionic ability of the individual with magical bionics far less than normal bionics and have many features not available in normal cybernetics. Also bionic limbs are far stronger than normal cybernetics and have a strength similar to that of many supernatural creatures. 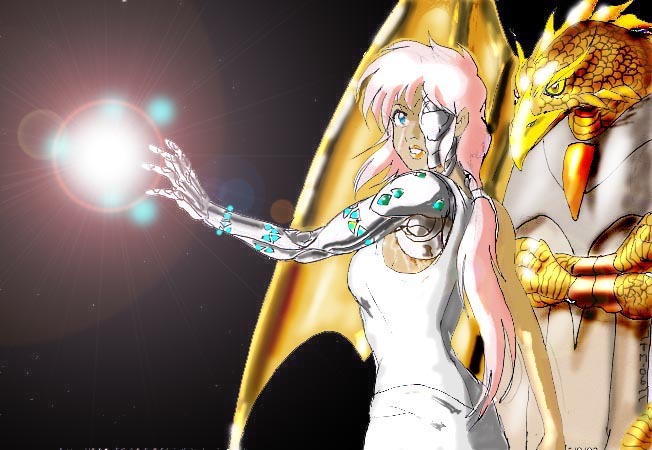 In appearance, Techno-Wizard bionics and cybernetics look similar to normal cybernetics and bionics but normally integrate precious metals and stones into their design. They are often highly decorated and very attractive. Normal (non-magical) cybernetics can be integrated into magical bionics and cybernetics but cost more than they normally. Normal Cyborg Body Armor can be used but special magical armors are available as well. For beings who were not spell casters before their were converted, they must have the Skill of Magic Lore to uses the special abilities of the cybernetics and bionics. Enhanced strength of the T.W. Implants can still be used and conventional cybernetics can still be used normally. Some Cybernetics are available in two different styles. One requires P.P.E. each time it is used and the other is always active. Duration of the magic of the cybernetics (if not permanent) is per the level of the Techno-wizard for those with the cybernetics who are not spell casters themselves. For those who are spell casters, the level of spells for the cybernetics are either the techno-wizard or the spell caster, whichever is higher. All normal (non Magical) cybernetics and bionics can be added to magical cyborgs at twice normal cost. The extra due to integrating magical and non-magical cybernetics. Attributes can be increased to maximum level listed under cybernetic type. Base attributes start at 10 and attributes are purchased per limb. Increasing Physical Strength or Physical Prowess costs 10,000 Credits per attribute point. Increasing Speed costs 2,000 Credits per attribute point. Unlike normal Bionics, a being who is full conversion borg does not lose aura and can be effected by the psionic ability of Bio-Manipulation. A being that is a partial conversion Cyborg has their P.P.E. and I.S.P. reduced by 25% and all saving throws against spells cast by the being have a bonus of +2 to save. Normals with a T.W. partial conversion get 3D6 for base P.P.E. A being that is a full conversion Cyborg has their P.P.E. and I.S.P. reduced by 50% and all saving throws against spells cast by the being have a bonus of +4 to save. Normals with a T.W. full conversion get 3D6 for base P.P.E. If being with Techno-Wizard Cybernetics has Anti-Magic Cloud (or a similar spell) cast on them, all abilities of the cybernetics and bionics are reduced by half for the duration of the anti-magic cloud or until the individual can escape the cloud. Because of the loss of P.P.E. with full and partial conversion cybernetics, P.P.E. Batteries have been developed to replace the lost magical energy sources. These P.P.E. batteries use emeralds and can be used to power both spell casting and each Battery can store up to 20 P.P.E. and regenerates at the rate of 2 P.P.E. per hour normally, 10 P.P.E. per hour at a ley line, and 20 P.P.E. per hour at a nexus point. Magical Senses: Must have Cybernetic Eyes or some type of internal camera to use all but Tongues. Tongues requires cybernetic hearing and voice box. Detect Concealment: As per spell, Costs 60,000 Credits for permanent, costs 12,000 Credits with a duration of 4 melees per level and requires 6 P.P.E. to activate. Eyes of the Wolf: As per spell, Costs 250,000 Credits for permanent, costs 50,000 Credits with a duration of 20 melees per level and requires 25 P.P.E. to activate. See Aura: As per spell, Costs 60,000 Credits for permanent, costs 12,000 Credits with a duration of 1 melees per level and requires 6 P.P.E. to activate. See the Invisible: As per spell, Costs 40,000 Credits for permanent, costs 8,000 Credits with a duration of 4 melees per level and requires 4 P.P.E. to activate. Sense Magic: As per spell, Costs 40,000 Credits for permanent, costs 8,000 Credits with a duration of 8 melees per level and requires 4 P.P.E. to activate. Tongues: As per spell, Costs 120,000 Credits for permanent, costs 30,000 Credits with a duration of 12 melees per level and requires 12 P.P.E. to activate. Magical Defenses: These magical additions can only be added to partial and full conversion cyborgs. Armor of Ithan: As per spell, Gives 10 M.D.C. and has a duration of 4 melee per level, Costs: 400,000 Credits, requires 10 P.P.E. to activate. Armor Bizarre: As per spell, Gives 15 M.D.C. and has a duration of 4 melee per level, Costs: 600,000 Credits, requires 15 P.P.E. to activate. Invincible Armor: As per spell, Gives 25 M.D.C. and has a duration of 3 minutes per level, Costs: 800,000 Credits, requires 40 P.P.E. to activate. Impervious to Energy: As per spell, Has a duration of 20 melee per level, Costs: 800,000 Credits, requires 20 P.P.E. to activate. Shoot Fireball: From a Cybernetic Eye, hand, Finger, or Arm a blast of fire can be fired. Effects are the same as the spell. Inflicts 1D4 per level with a range of 90 feet, Cost: 100,000 credits, requires 10 P.P.E. to fire one ball of fire. Shoot Firebolt: From a Cybernetic Eye, hand, Finger, or Arm a bolt of fire can be fired. Effects are the same as the spell. Inflicts 4D6 with a range of 100 feet plus 5 feet per level, Cost: 70,000 credits, requires 7 P.P.E. to fire one bolt of fire. Sub Particle Acceleration: From a Cybernetic Arm a powerful bolt of energy can be fired. Effects are the same as the spell. Inflicts 1D6x10+1 per level with a range of 100 feet per level, Cost: 200,000 credits, requires 20 P.P.E. to fire one bolt. T. W. Converted Weapons: All standard Techno-Wizard converted weapons can be mounted on a T.W. Cybernetic Limb. Follow rules under description of Techno-Wizard. Magical Means of Motivation: These magical additions can only be added to partial and full conversion cyborgs. Fly as the Eagle: As per spell, Has a duration of 20 melee per level, Costs: 250,000 Credits, requires 25 P.P.E. to activate. Levitation: As per spell, Has a duration of 12 melee per level, Costs: 70,000 Credits, requires 5 P.P.E. to activate. Winged Flight: As per spell, Has a duration of 20 melee per level, Costs: 350,000 Credits, requires 35 P.P.E. to activate. Escape: Made as part of Cybernetic hands. As per spell, Costs: 170,000 Credits, requires 8 P.P.E. to activate. Chameleon: For Partial and Full Conversion Cyborgs. As per spell, Has a duration of 18 melee per level, Costs: 220,000 Credits, requires 6 P.P.E. to activate. Invisibility Superior: For Partial and Full Conversion Cyborgs. As per spell, Has a duration of 12 melee per level, Costs: 3,000,000 Credits, requires 20 P.P.E. to activate. Shadow Meld: For Partial and Full Conversion Cyborgs. As per spell, Has a duration of 12 melee per level, Costs: 3,000,000 Credits, requires 20 P.P.E. to activate. Fast Strike: Only effects attacks using melee weapons and hand to hand strikes, treat as per spell Speed Weapon except effects all melee attacks. Has a duration of 1 melee per level, Costs: 5,000,000 Credits, requires 100 P.P.E. to activate. Special armor constructed similarly to Mystic power but lacks most of the special features of the armor. Worn in the same fashion as normal Cyborg body armor. Gives the abilities of Chameleon and Impervious to fire. M.D.C.: 150 (Armor of Ithan and 100 P.P.E. will restore all M.D.C. Image drawn and copyrighted by Talis D. Merrill (taalismn@pop.tiac.net). Copyright © 2001, 2006, & 2008, Kitsune. All rights reserved.